Ericsson Mobility Report provides insight into the future of 5G networks, including a forecast of 150 million 5G mobile subscriptions by 2021. South Korea, Japan, China and the US are predicted to lead with the first, and fastest, 5G subscription uptake. 5G will connect new types of devices, enabling new use cases related to the Internet of Things (IoT); the transition will open up new industries and verticals to ICT transformation. The report, a comprehensive update on mobile trends, reveals a significant increase in mobile video consumption, which is driving around six times higher traffic volumes per smartphone in North America and Europe (2015 to 2021). North America data traffic per active smartphone will grow from 3.8 to 22 GB per month by 2021; in Western Europe, the increase is from 2 to 18 GB per month. With 20 new mobile broadband subscriptions activated every second, global increase in mobile subscriptions is another clear driver for data traffic growth. As of now, there are the same amount of mobile subscriptions as there are people on the planet; in 2016 we will reach the four billion mark for smartphone subscriptions alone. Rima Qureshi, Senior Vice President & Chief Strategy Officer, Ericsson, says: "5G is about more than faster mobile services - it will enable new use cases related to the Internet of Things. For example, Ericsson has built a prototype testbed for applying 5G networking functions and data analytics to public transport, which can save resources, reduce congestion, and lower environmental impact. ICT transformation will become even more common across industries as 5G moves from vision to reality in the coming years." 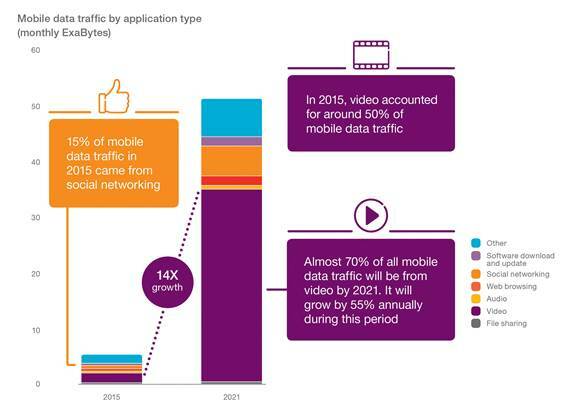 · Video dominates data traffic: Global mobile data traffic is forecast to grow ten-fold by 2021, and video is forecast to account for 70 percent of total mobile traffic in the same year. In many networks today, YouTube accounts for up to 70 percent of all video traffic, while Netflix's share of video traffic can reach as high as 20 percent in markets where it is available. · Mainland China overtakes the US as world's largest LTE market: By the end of 2015, Mainland China will have 350 million LTE subscriptions - nearly 35 percent of the world's total LTE subscriptions. The market is predicted to have 1.2 billion LTE subscriptions by 2021. · Africa becomes an increasingly connected continent: Five years ago (2010) there were 500 million mobile subscriptions across Africa; by the end of 2015 this number will double to 1 billion. Increased connectivity improves the prospect of financial inclusion for the 70 percent unbanked through mobile money services starting to take form across Africa. · ICT powers the low-carbon economy: ICT will enable savings in energy consumption and greenhouse gas (GHG) emissions across all other industrial sectors. The total emission reduction could be up to 10 gigatonnes of CO2e, representing about 15 percent of global GHG emissions in 2030 - more than the current carbon footprint of the US and EU combined. New to the report is the Mobile Business Trends appendix. The appendix outlines eight trends that detail how successful mobile operators are using different ways to monetize the explosion in data consumption and growing demand for mobile services. The Ericsson Mobility Report is one of the leading analyses of data traffic available, providing in-depth measurements from live networks spread around the globe. The report uses these measurements and analysis, together with internal forecasts and other relevant studies, to provide insights into current traffic and market trends in the Networked Society. The Traffic Exploration Tool, which accompanies the report, can be used to create customized graphs and tables using the newly published data. The information can be filtered by region, subscription, technology, traffic and device type.